My husband and I took up golf last summer, so to start off the season we decided to host a golf party for the Masters. We all went golfing and then back to our house to watch the Masters. I decided to make this golf cake, which would look like a golf course, for the occasion. I used 2 eight inch cake pans and made a white cake. I used a vanilla icing (white) and died it green (grass) and blue (water). I also used a wafer cookie for the sand trap. I used cake toppers for the golfer and the hole. 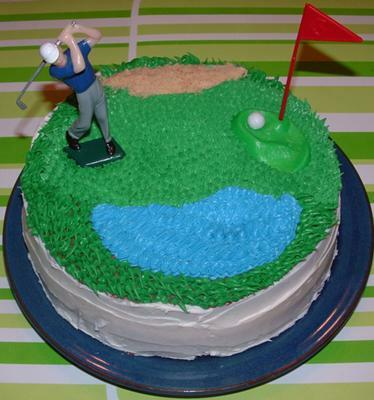 The golf cake was a nice fun surprise to eat while watching the Masters.